Salt & Chilli may have stolen the crown from sweet & sour for the most popular Chinese dish. With good reason too as I know I am not alone in saying it is probably my favourite Chinese dish. I usually prefer it made with seafood but this was a last minute decision which entailed a visit to my local Co-op where squid was non-existent and only the cooked plastic type prawns were available. Not to worry as chicken breasts work fantastically well and are easier to cook. The first step is to cut the chicken breasts into thin slices. 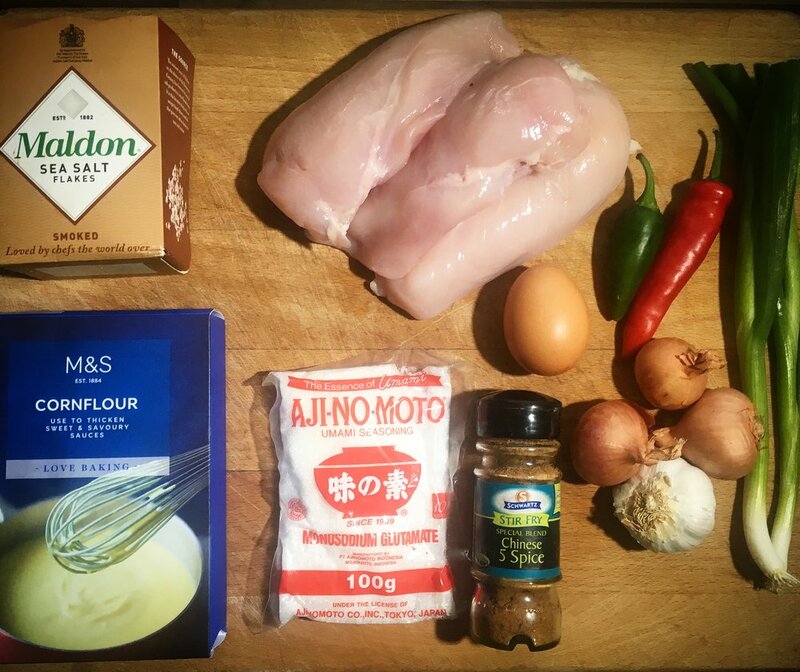 For the crispy coating, you will need to mix the chicken with the an egg, cornflour and 5 spice. If you can do this an hour before frying you will get a better result as the coating will stick better to the chicken. 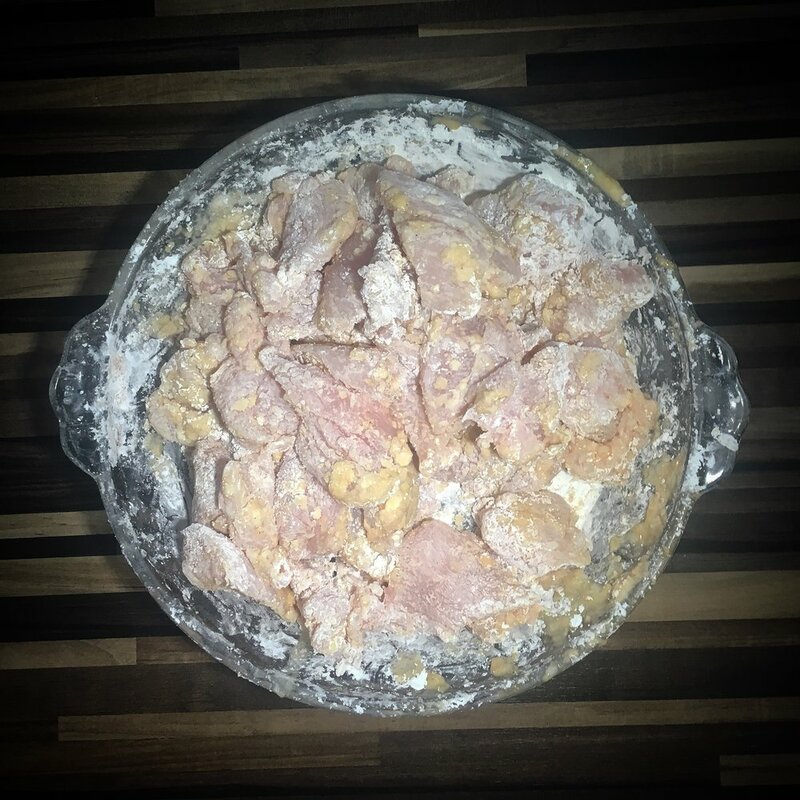 After an hour in the fridge it should look something like below; before frying dust with more cornflour until the chicken pieces no longer stick together. Heat the oil and fry the chicken in two batches to ensure the temperature doesn't drop. As it is finely sliced it should only take around 2 minutes to fully cook. Once both batches have been cooked set aside on some kitchen roll to let the excess oil drain. The next step is to put a wok on high heat along with a drop of vegetable oil. 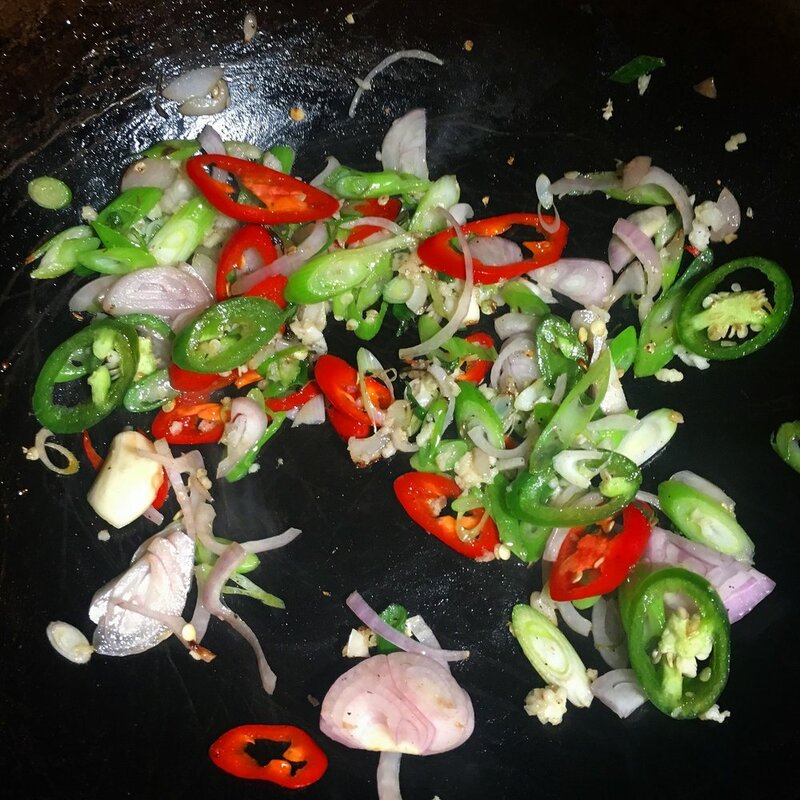 Add the shallots, chilli, garlic and spring onion and fry for 30 seconds. Add the chicken and sprinkle with the salt and pepper seasoning. Taste as you go and if you need more or less salt adjust to taste. The umami seasoning is basically MSG or Monosodium Glutamate which I know has a less than glowing reputation. It was used as it is as authentic ingredient in this dish and personally I am not sensitive to it. If you want to read more on MSG click here. Stir fry the chicken and vegetables for a further 2 minutes and serve with boiled/fried rice and an ice cold chinese beer.